A nasty flu segued from one trip into another, and I'm off again to my family vacation in Grayton Beach, Florida! Please forgive my weeks of absence while I lay claim to the blogging hiatus which is appears to be contaigious in August's blogosphere. Frankly, without air conditioning and with record summer highs of 100 degress here in NYC, not only is it too hot to cook in my kitchen or even blog at my computer (also in my kitchen), it's almost too hot to venture out of sequestration by the window unit in the bedroom to get a glass of water. In Grayton this coming week, as you may remember, my mojito skills will be put to the test. I'll also be preparing a Tuscan meal for eleven adults and nine children, so expect reports on that as soon as I get back - I'm very excited about the menu I planned. 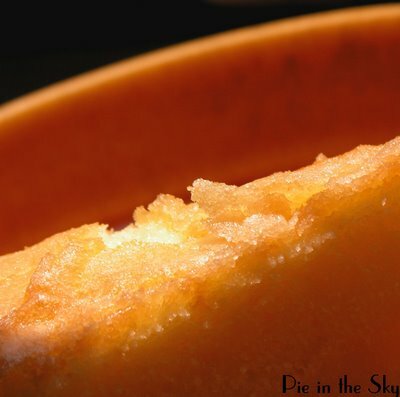 (Hint: it has several elements that had been featured before on Pie in the Sky!) In fact, since the week's dinner structure is that each of my siblings (and/or their spouses) prepares a meal for everyone, I ought to have lots of yummy recipes to report! In the meantime, I shall be browning in the sun like a pie in the oven and reading Julie and Julia. And playing marco polo with nine enthusiastic little opponents. See you on the 16th! Peel cucumber; remove ends, slice in half and scoop out seeds. (Alternatively, simply ppel and slice a small English cucumber, which is seedless.) Chop into quarter-inch slices. Combine with water and chill. Ice-cold cucumber water is a summer essential in my fridge - its delicate flavor and crisp tang make it twice as refreshing as a regular glass of H20. Preheat oven to 350°F. Grease 9-inch layer pan or springform pan lightly with olive oil. Grate 3 teaspoons lemon zest with a fine rasp. Toss zest with flour. Squeeze and reserve 3 tablespoon lemon juice. Beat together yolks and 1/2 cup sugar in a large bowl with an electric mixer at high speed until thick and pale, about 3 minutes. Reduce speed to medium and add olive oil and lemon juice, beating until just combined. Using a wooden spoon, stir in flour mixture (do not beat) until just combined. Transfer batter to springform pan and gently rap against work surface once or twice to release any air bubbles. Sprinkle top evenly with remaining 2 tablespoons sugar. Bake until puffed and golden and a toothpick inserted in center of cake comes out clean, about 45 minutes. Cool cake in pan on a rack 10 minutes, then run a thin knife around edge of pan and remove side of pan. Cool cake to room temperature, about 1 1/4 hours. Remove from pan and transfer cake to a serving plate, top side up. This is a light, delicately flavored pound cake with golden olive oil overtones. Fabulous with gelato or fresh fruit. Aw, thanks! Yeah, a friends recommended J&J to me too, so I'll let you know how it is =)Keep cool! Cucumber water...that sounds like one of those odd things that may turn out to be perfect so I'll have to try it. 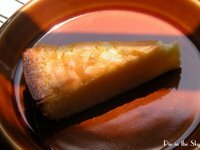 Lemon Olive Oil Cake...also sounds like one of those odd things that may turn out to be perfect so I've got to try it also. And how hot is it? At 2 AM its 85°. I believe that's hot. I have seen cucumber water before [as well as rosemarry and raspberry water] but have never tried it. I was skeptical at first, but I think I'll give it a try! Enjoy! I am heading home from my vacation--so good to get away. Hope you have a great time. I have had cucumber water in my fridge all through this nasty heat wave...thank goodness its getting back to normal temperatures, I hope your temperature gets back to normal too, soon! This cucumber water is an excellent idea. I am going to try it. Thanks! I love the olive oil cake recipe. One small suggestion I would add is that extra-virgin olive oil should be used in place of any olive oil because it enhances the flavor. as was the method over 3,000 years ago. I am Italian and my grandmother used to make a similar cake all the time for us. I love it for breakfast!oh, sometimes I add rosemary to it.